Hi there, we’re Kim and Byron and our dog is Frankie. We are a young professional couple living in our own home in Erskineville. We love hanging with Frankie, taking him for walks, swimming and going to the many different parks around the area. 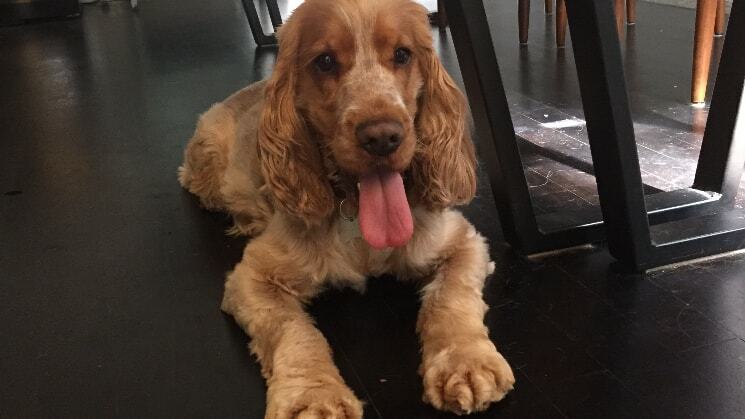 Frankie is a 3 year old cocker spaniel who loves every dog and would love to have some friends over every now and then. He is very friendly and submissive and enjoys some relaxing and naps often. We have a medium sized dog door which leads out to a back deck and backyard with trees. This would probably fit up to 15kg however can come round to see if they fit. Your dog would also be able to sleep inside as does Frankie. We work during the week, occasionally from home and on weekends we would be with your dog majority of the time. We are unable to mind dogs that are not toilet trained or at risk of marking their territory in our home. We prefer to have a meet and greet prior to confirming a booking to ensure both parties feel comfortable especially the dogs! Please contact us for a meet and greet to see if your dog will be happy with us! We look forward to hearing from you and meeting your doggy! Our dog had a great time at Kim and Byron’s! Lovely to get photo updates while we were on holiday and being able to accomodate us on timings. We had a meet and greet a few weeks before to meet the resident dog Frankie which gave us peace of mind that the two dogs would get along and she’d be well looked after. They did a marvelous job of looking after my two pups for two weeks. They kept me updated with photos and messages. I was able to enjoy my break without worrying. Highly recommended!